I can say Alexa as many times as I like here because she can’t hear me and won’t turn on. For those of you who have no idea what I’m talking about, Flash Briefings is service offered by Amazon for their Alexa and Echo customers. 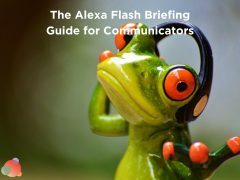 A Flash Briefing is a customized rundown (or, well…briefing) composed of audio segments that users can customize with content (called skills) that different organizations or people create. Every day, they can ask Alexa to play their briefing, and the service will play that day’s new audio segments. It’s your very own special snowflake, customized news report. There are all sorts of Skills available, and more are being created every day. Local news organizations, professional communities, historians, economists, celebrities— anyone can create a skill that is relevant to their interests and the interests of their communities. As communications professionals, it’s time to seriously consider creating your own Alexa Skill, either for the company or for your client’s organizations. 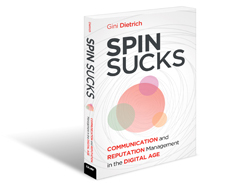 They are a great way to keep your brand present and top-of-mind, engage your audience, and get your content into the same space as organizations such as CNN, NPR, and the BBC. While you can create updates for your Flash Briefing as often as works for you, daily tends to work the best because of the consistency nature of it. 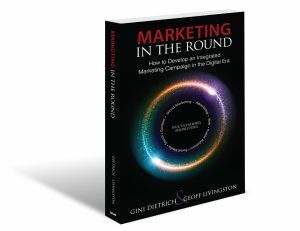 That, of course, can make it a challenge from both a time-perspective and a coming-up-with-new-content perspective. So let’s talk a little bit about the types of content that will lend themselves best to Flash Briefings. The first and biggest one is news. If any area of your business requires staying current—and current is something that changes regularly—then a daily update of what is happening in your space can be hugely valuable to listeners. Think newspapers and journalism, highly regulated industries such as medicine, law, finance, and real-estate. If you have access to the latest in what’s happening, you can use it to enhance your brand. Second, and slightly easier than creating the news, is commenting on it. Nearly every industry has daily news or consistently updated content so take those headlines, articles, podcasts, videos, or other publications, briefly explain them, and provide your opinion on why it’s important, or what your audience should do with the information. Next up is repurposing your content archive. If it’s evergreen, this can be a great way to give what you’ve written or recorded in the past a second life. Go back through your old content and find interesting, stand-alone snippets that you could turn into audio segments. You’ll want to re-write them as complete thoughts, but this method is very easy to batch, which, for a daily release, will be important. Finally, general interest topics can be very popular. Think word of the day, interesting fish facts, historical tidbits, or gardening tips. As it turns out, this week alone, we have bubble bath day, national dress up your pet day, national nothing day, national popcorn day, and penguin awareness day (which my kid will surely celebrate). All of those can be used for fun and general tidbits for your Flash Briefing. Truly, anything that can be produced each day, isn’t sequential, and speaks to a particular type of person is great for a Flash Briefing. 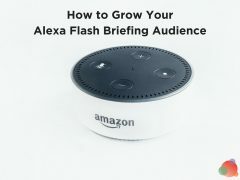 For those of you who want to create Flash Briefings, here are some tips, and things to keep in mind as you get going. Alexa isn’t going to shoehorn your content into people’s briefings. This means you need to tell people that your content is available for their briefing, and show them how to access it. Promote your Flash Briefing Skill(s) the same way you promote all of your other content. Post about it on social media, add links to it from your blog, and email your list. Something important to keep in mind is that Flash Briefings are compiled every day, and only content for that day will be included. That means that your first briefing is going to be played by Alexa once and then your content won’t be played until you next upload one. Keep your segments short, and make sure they are good quality audio. You don’t want to be the lowest quality host in someone’s morning news report, and you don’t want to be the one who drones on and on. People add many different skills together, so be mindful of the fact that you’re sharing a stage. Keep things short, punchy, and interesting. Keep SEO in mind. You’ll have space for a good number of keywords, and people will use them to find the skills they want to to learn about. It won’t be the easiest content you ever create, but I am absolutely convinced this is a channel that is going to take off, and those who don’t get in early will wish they had. There are a lot of technical steps to setting up a Flash Briefing that I’m not going to get into here. You can bet Flash Briefings are on our content list for 2019.